You probably won’t be surprised that every public university in Washington has a “Red Square” on its campus! Known for its students’ progressive political views, the Red Square at Western Washington University is the academic heart of campus, a large paved quad, surrounded by the library and four other academic buildings. Western Washington was originally founded as a teachers’ college, and it’s home to the oldest environmental college in the country as well as the planet’s only undergraduate environmental magazine. WWU is also the largest feeder school for educators in the state of Washington. WWU’s 16,000 undergraduates find it easy to have relationships with professors; 70% of the classes have fewer than 40 students, and the faculty-to-student ratio is 18:1. Students find it easy to change majors, as well as to double major or add a minor, and mentored research opportunities for STEM students are readily available. My two tour guides were each double majoring with a minor: Jordan was a dramatic writing/theatre major, with an arts entertainment minor, and Seth started as a music major but changed to computer science and political science, with a music minor. The broad spectrum of liberal arts offerings at WWU allows students to explore and change their mind, but also meet the graduation requirements in four years. Western Washington University has a strong Honors program, which is over 60 years old. Forty percent of honors students are out-of-state, and nearly half are STEM majors (honors program students can be in any WWU major). The honors program has about 550 students total, so each year they add about 160-170 new freshmen. Nearly all honors students choose to live in honors housing, where they have additional advising and a dedicated student life coordinator. Honors students have smaller classes, and faculty compete to teach interdisciplinary seminars in this program. Here’s a sample of the interesting seminars available to upper-division honors students. Most honors students choose to do a senior capstone project, which they partner with a faculty member to oversee. This capstone can be a thesis, but could also be a performance or a longer form project. Average scores for incoming honors students is 1330-1430 (SAT) and 29-33 (ACT), and 3.88-3.99 unweighted GPA. The admissions committee asks applicants to write a short personal essay about their personal motivation for being a part of the honors community. They are looking for temperament, something that shows the student recognizes they are not a finished product. There’s no Greek life at WWU – the school allows the students to revisit this decision every four years. Journalism and the arts are strong here – there is a quarterly photo magazine and the school paper focuses on investigative journalism. There are also two student-run art galleries, which feature student artwork. WWU has Division 2 sports, but the school defunded its football team in 2009 to ensure the strength of the other sports. Located just south of the Canadian border, Western Washington has an immense 7,000-acre campus. The academic portion of campus takes up just a fraction of this land, which is adjoined by an incredible arboretum with several hundred acres of forest, and 7 miles of hiking and biking trails. The city of Bellingham is also quite bicycle friendly, with a cute little downtown area with restaurants and shops just a few minutes from campus. Vancouver is about an hour away (not counting time to cross the border) and Seattle is about an hour and a half away. Western Washington is an ideal campus for students who thrive in the Pacific Northwest’s climate, and who want to be close enough to big cities but not right smack in the middle of one. Don’t be surprised to see a deer wandering though the main parking lot across from the band new Carver Gym – we did! WWU offers WUE pricing for west coast residents, and the medium size is a perfect fit for many students. 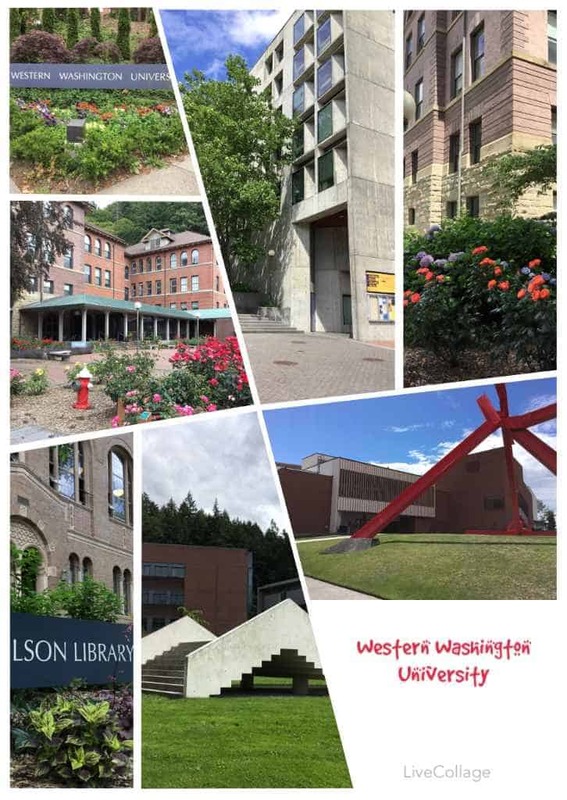 Evelyn visited Western Washington University during the summer of 2018. You can scroll through her photo album below.